I remember being frustrated and despondent during the presidential administration of George Herbert Walker Bush, as he consistently opposed or lacked interest in any of the policies I supported, and at one point before the invasion of Iraq to restore Kuwaiti sovereignty after Saddam Hussein took over Kuwait, I thought what we now call the Persian Gulf War could become World War III. And I was always annoyed how he got elected to succeed Ronald Reagan, using all sorts of dirty tricks and irrelevant issues against his 1988 Democratic opponent, Massachusetts governor Michael Dukakis. 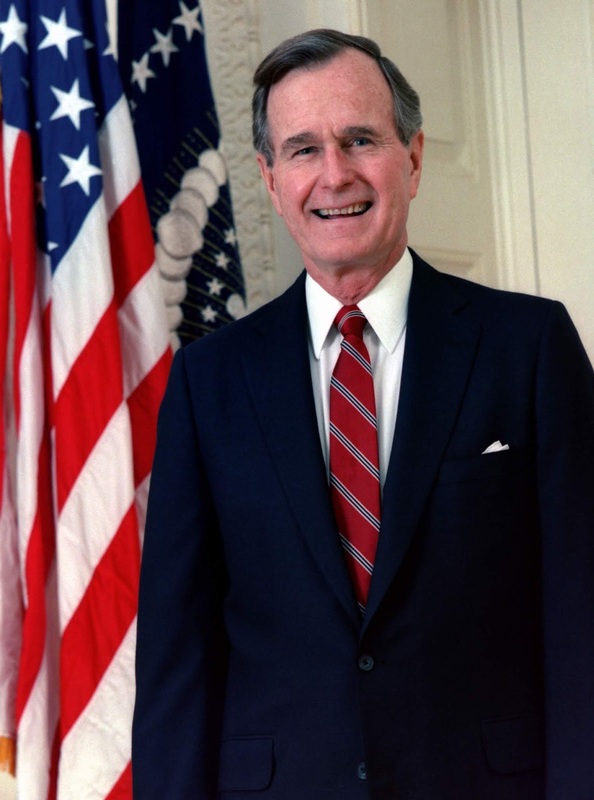 (The Bush mud-slinging campaign and its fixation with the Pledge of Allegiance and furloughed Massachusetts inmate Willie Horton even infuriated Barry Goldwater.) But Bush, who died yesterday, looks better in retrospect, at least partially. On the one hand, the forty-first U.S. President locked in Reagan's supply-side approach to domestic policy, but he also compromised with congressional Democrats to get the budget deficit down and get the economy going again, even if it meant raising taxes. On the one hand, he put Clarence Thomas on the Supreme Court, but he also appointed David Souter. And while Lech Wałęsa and Pope John Paul II may have unraveled communism in Eastern Europe, Bush, who had succeeded as President the most hardened Cold War leader since John F. Kennedy, continued the relationship with Mikhail Gorbachev that Reagan had had with him, and he carefully avoided grandstanding when the Berlin Wall fell, paving the way for a united Germany within NATO. He vowed not to rub in the fall of the communist bloc on Gorbachev by standing on the Wall and breaking out in song (which he left for Crosby, Stills and Nash), and he didn't gloat when the Baltic States seceded from the Soviet Union (the United States had never recognized Soviet annexation of the Baltics in the first place), paving the way for the remaining twelve Soviet republics to go their own separate ways peacefully. And when he refused to have American troops march on to Baghdad after liberating Kuwait, it turned out to be the right decision - a decision vindicated, ironically, by his son. So, on balance, Bush the Elder batted about five hundred. That's better than popping up and claiming to have knocked the ball out of the park, something the current White House occupant is known for.